Have you ever thought of eating fruit at -40°C? With LIFE blast chillers, you can! Use this “cool” idea to impress your guests and get your kids to eat fruit! Wash the fruit thoroughly and cut the apples, oranges, lemon and lime into thin slices. 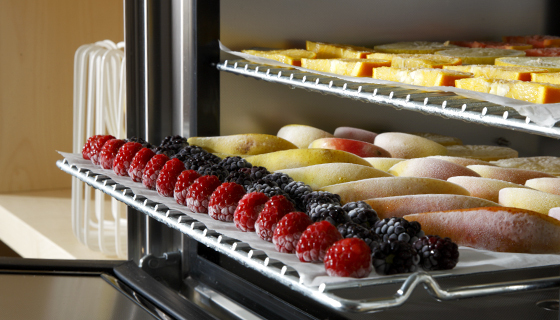 Cover the racks of your LIFE blast chiller with a sheet of baking paper and arrange the sliced fruit, raspberries and blackberries neatly. Be careful not to overlap the pieces to prevent them from sticking together. Put everything into LIFE blast chiller and start the deep freezing process > Timer > Fruit > Slices > set the load depending on the amount of product > Start. LIFE will soon bring the temperature down to -40°C and deep freeze the fruit. with the micro-crystallization of water, fruit becomes chewable! This very low temperature and the taste of fruit will create a pleasant sensation that will wow your guests and kids!